Iron Fist was one of the most highly-anticipated Marvel Cinematic Universe Netflix series - and ultimately, the most disappointing. The series promised to bring the world of Kung Fu action to the MCU, but showrunner Scott Buck and his team simply didn't have enough time to prepare either a compelling storyline, or thrilling fight sequences. With the arrival of Iron Fist season 2, Marvel fans are still keeping the fires of hope burning - but is their faith misplaced? The short answer is: not really. NOTE: This is a Spoiler-Free Review of Iron Fist season 2 episodes 1-6 (out of 10). After the events of The Defenders, we find Danny Rand / Iron Fist (Finn Jones) fulfilling his promise to defend the streets of NYC, as a vigilante hero in the vein of Daredevil. However as Danny now plays hero, he finds himself sinking into the existential crisis of being so far removed from his original destiny as the Iron Fist. 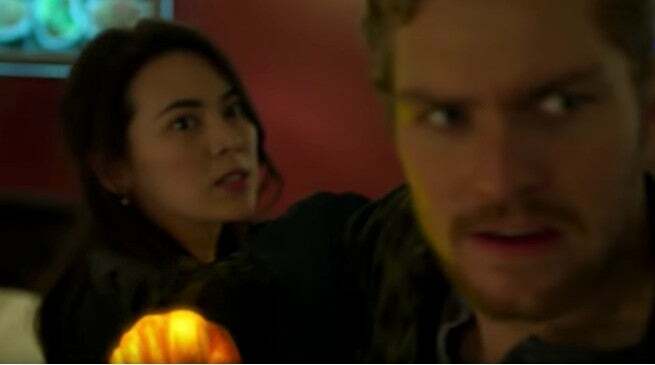 Colleen Wing (Jessica Henwick) is growing concerned about Danny - but her concerns may be misplaced. As Danny and Colleen are focused on preventing the latest Chinatown gang war, Danny's old friends Joy Meachum (Jessica Stroup) and Davos (Sacha Dhawan) are lurking in the wings, slowly but surely gathering resources for a major revenge plot against Danny. That plan has lot of moving pieces, which include causing turmoil in the criminal world; shaking things up at Rand Industries; and using the ancient mysticism of K'un Lun for a nefarious end goal. As it quickly becomes apparent to Danny, the question isn't whether he can stop all of these plots against him, but rather, whether or not he can do so without compromising his friendships, and ultimately, his soul. Here's the big question that most Marvel Cinematic Universe fans want answered: Is Iron Fist season 2 an improvement over season 1? The answer is that while there are still some drawbacks to Iron Fist season 2 (more on that below), it is definitely off to a better start than anything we saw in season 1. The main fan-focus will of course be the action, and the fight sequences in season 2 - even in the first episodes - are much more frequent, with much better fight choreography by stunt coordinator Clayton Barber, and much more extensive fight training on the part of the actors and stunt performers. Thankfully the action scenes are not just gimmicky fights: the fight sequences involving Danny, Colleen, Misty, Davos, etc. are firmly rooted in season 2's larger gang war story arc - which is not too far removed from the narrative structure of Luke Cage season 2. The stakes of each fight make the sequences more thrilling - especially since the visual effects are also much stronger, making Iron Fist season 2 a much better offering of fantastical Marvel super hero action. The cast also clearly has more to work with this time around, and settle into their respective characters with much greater ease. Finn Jones makes Danny Rand much less of an annoying petulant child, and much more of a brooding warrior trying to find himself. Jessica Henwick steps up to be an co-lead in season 2 (thankfully so), while even Tom Pelphrey's Ward Meachum gets a much more layered and interesting dramatic arc. However, if there is one standout character in Iron Fist season 2's first batch of episodes, it's no doubt Alice Eve as the MCU version of Typhoid Mary. Without dropping any spoilers, Eve's MCU version of Mary is by far the most compelling character arc early on in season 2. Eve plays Mary as a person with several different personalities (based on the character's multiple personality disorder), and she makes each version of Mary compelling, while the interaction between the two personalities becomes an interesting subplot all its own. Hopefully, Typhoid Mary gets a bigger arc in the back half of the season, because it would be a major wasted opportunity if she does not. Finally, some MCU crossover cameos also provide a nice lift - specifically Simone Missick's Misty Knight, whose continuing storyline with Colleen Wing once again makes a "Daughters of the Dragon" spinoff look like an exciting future opportunity for Marvel. While Iron Fist season 2 starts off on a much better foot than season 1, it's also not at all a slam-dunk improvement, in terms of storyline and pacing. Iron Fist season 1 was notoriously slow with its thirteen-episode arc, ultimately providing little to nothing in the way of significant payoff, or compelling twists. Season 2 gets does the twist part better, but still feels small and circular in terms of scope and geography, once again failing to make NYC feel like a "character" all its own. It seems as though much of the time in the first six episodes is spent bouncing between Danny and Colleen's apartment, Joy's apartment, Mary's apartment, or select streets and warehouse locations in Chinatown. Every Marvel Netflix season has a "single setting episode" which sees the hero pretty much confined to one location (usually because he/she is captured or injured); Marvel fans will groan and eye roll to learn how Iron Fist season 2 attempts to pull that off with an entire episode largely dedicated to a dinner party (you read that right). While we do get to finally see some of the inner workings of K'un Lun, it's more of a tease, with one or two lavish and/or ornate set pieces the only extent of K'un Lun the show can muster. Much of the meatiest parts of the K'un Lun mythos are still conveniently side-stepped, and we can only hope more of the key moments or backstory get revealed in the latter episodes. As stated, Alice Eve's Typhoid Mary is a major standout in season 2, but beyond that character, Iron Fist once again suffers in the villain department. The first six episodes do set up an arc with Davos and Joy Meachum that could pay off in a big way during the back half arc - but to call that buildup a "slow burn" would be an understatement. Joy and Davos aren't exactly compelling villains on their own (in fact, their mutual turn towards villainy seems forced), and their chemistry as co-conspirators is strange at best, awkward at worst. Luckily, Typhoid Mary comes in to balance things out, and help set up the larger villain arc for an exciting finale. Regardless, it's still bad sign that a show built on marital arts action fantasy struggles to find worthy foes for the heroes. Iron Fist season 2 will at least be enough to sate Marvel fans for a couple of months until Daredevil season 3 arrives late in 2018. Danny Rand's sophomore outing should also be enough of an improvement to carry the show into either season 3, or perhaps the even better prospect of a Heroes for Hire spinoff with Luke Cage and Misty Knight officially partnering with Danny and Colleen. All in all, it's not a bad way to kick off the fall TV season. Iron Fist Season 2 premieres all 10 episodes on Netflix starting Sept. 7th.